It’s hard to get a proper feel for sound at a trade show, but I was especially interested to know how these feel – particularly with some compromises keeping price and size down. Benjamin Weiss of De:Bug, partner in crime in both journalism and music making, joined me. See Benjamin’s video below for some sound recorded in mono from a line out, plus my own video for a sense of scale/feel/finish; I hope to get better sound for you soon. But then let’s get to feel. 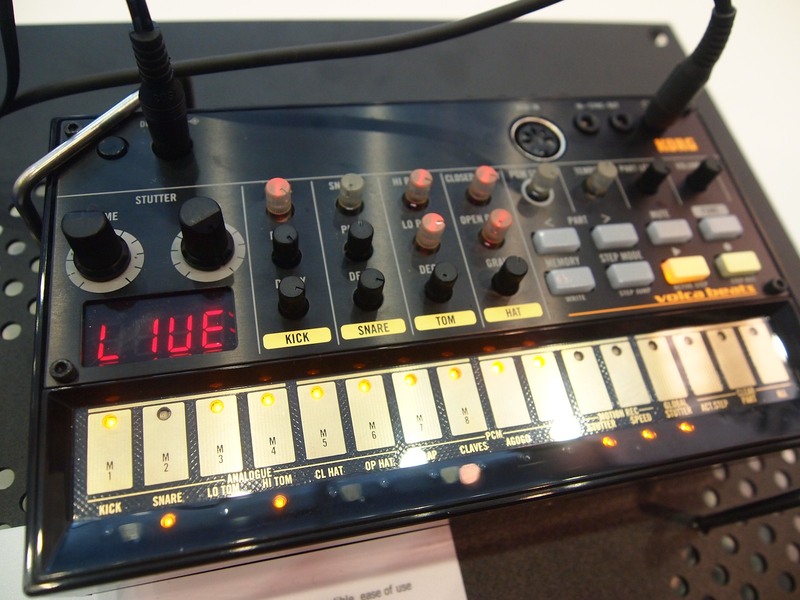 Each of the Volca, while clearly related, does take on its own character. The lead synth on Keys is actually really nice, even if the Bass is stealing some of its thunder online. Hit a sweet spot and it can make some nice sounds. There is some sonic range, particularly with saw and square waves at the ready and poly, unison, and ring options. 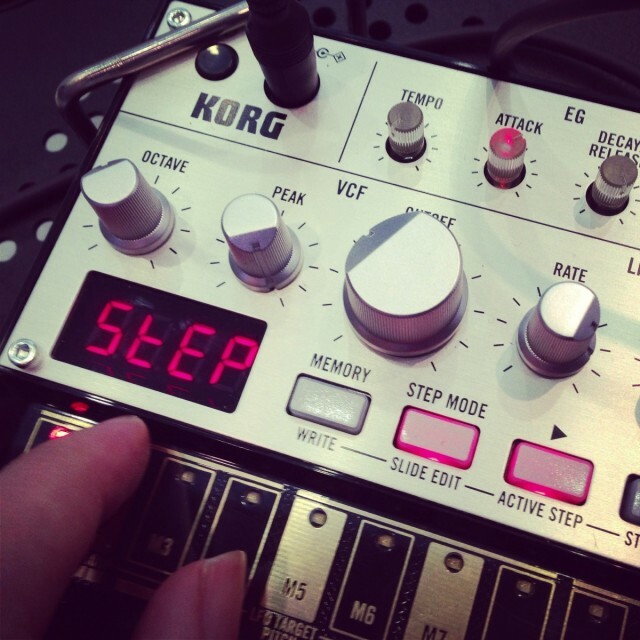 The Delay, as seen in the monotron, is a big part of its sound. And you finally get a proper resonance control on the filter, unlike some earlier monotrons. I do slightly miss the MS-10/MS-20 filter, but I need to hear more of this. For all this talk about analog sound, the Drums machine is fun partly for its crunchy low fidelity, particularly once you start manipulating the PCM sounds and using the “Grain” control on the analog hat. There are some real edgy sounds to be had. Feel was a bit easier to evaluate, and the news there to me was pretty good. Most of the controls are still the small, somewhat fiddly pots you know from the monotron, a concession to size. But the layout overall I found genuinely usable. And the overall feel is surprisingly nice: these really feel more expensive than their $150 street might suggest. There are some bigger, nicer knob caps on some of the controls – each one matched to the different controls. The Bass in particular benefits from this – its smaller control complement means it has mostly the nicer, bigger knobs on filter and LFO. The housing, too, seems more sturdy and fit and finish all look better overall. Everything has a bit of nice gloss to it. But the best surprise is the touch strip. It’s been given a complete redesign, with a high-gloss surface that’s nicer to touch and a wider area for your fingers. It’s still a bit frustrating trying to play a synth via a small touch strip, but this maximizes the experience. 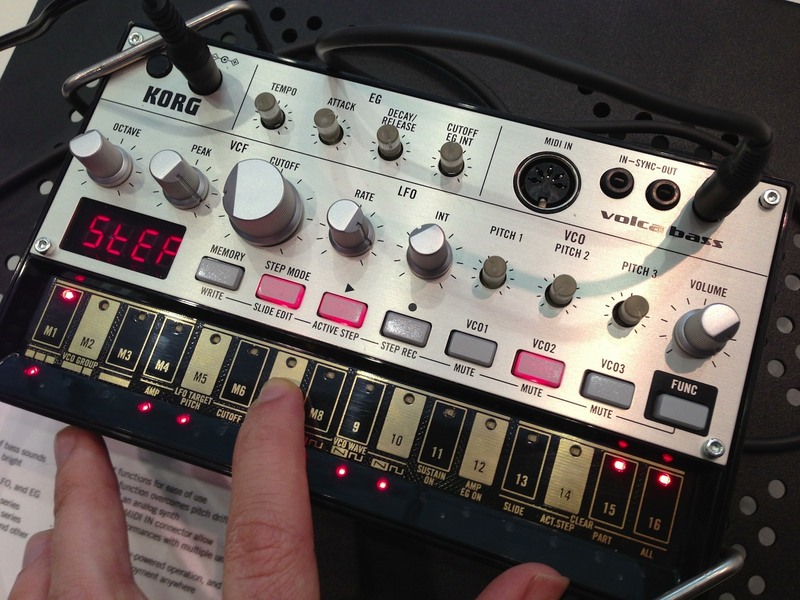 Despite their wild popularity in the last days, I’m not sure the Volcas are for everyone. They’re simple gadgets – part of their appeal, but it does mean you have to like these particular limitations – and while they’re alone at the $150 price point, you still have a number of affordable gear choices. But having this addition to your choices is a nice, unexpected gift indeed. We’ll try to grab some more sounds and expect a proper review when these ship.